نیروهای ضد پناهجو یان و ضد مهاجرین در کانادا تقویت می شوند . بادستگیری جوان سوری ، در شهر کینگستون و یک نوجوان زیر سن قانونی باتهام ساختن بمب به منظور خرابکاری ، جو سیاسی بدتر می شود . جوان 20 ساله سوری ساعاتی بعد آزاد شد . اثر منفی خبر دستگیری فراگیرتر است . حسام الدین الزهابی همراه با پدرش که از مخالفین اسد است ، به کویت مهاجرت کردندو بعد از ان در سال 2016 به کانادا آمدند . این مهاجرت از طریق اسپانسر شیب از طرف چهار کلیسا در انتاریو انجام شده است . پلیس به دلیل زیر سن 16 سال بودن متهم اصلی ،از افشای نام وی خودداری کرده است . A 20-year-old Kingston man has been released without charges after he was arrested with a minor in an alleged terrorist bomb-making plot. Hussam Eddin Alzahabi was released late Friday afternoon. 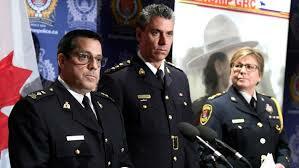 RCMP Supt. Peter Lambertucci, left, answers questions from reporters as Chief Supt. Michael LeSage looks on during a Friday news conference on the terror-related arrests the day before in Kingston, Ont. His friend, a minor, is facing charges related to the national security investigation that came from an FBI tip on December 21. The minor can’t be identified under the Youth Criminal Justice Act. Alzahabi’s release follows a pair of arrests in Kingston on Thursday. The youth, whose gender was not released, has been charged with knowingly facilitating a terrorist activity; and counselling a person to deliver, place, discharge or detonate an explosive with intent to cause death or serious bodily injury.